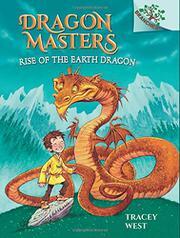 Drake has been selected by the king to serve as a Dragon Master, quite a change for an 8-year-old farmer boy. The dragons are a secret, and the reason King Roland has them is a mystery, but what is clear is that the Dragon Stone has identified Drake as one of the rare few children who have a special connection with dragons and the ability to serve as a trainer. Drake’s dragon is a long brown creature with, at first, no particular talents that Drake can identify. He calls the dragon Worm. It isn’t long before Drake begins to realize he has a very strong connection with Worm and can share what seem to be his dragon’s thoughts. After one of the other Dragon Masters decides to illicitly take the dragons outside, disaster strikes. The cave they are passing through collapses, blocking the passageway, and then Worm’s special talent becomes evident. The first of a new series of early chapter books, this entry is sure to attract fans. Brief chapters, large print, lots of action, attractive illustrations in every spread, including a maplike panorama, an enviable protagonist—who wouldn’t want to be a Dragon Master?—all combine to make an entertaining read.